Sam's math teacher has been sending daily updates, which I've been cheerfully reading and following up with Sam in the evening. "Remember to line up the decimals," I told him last night. There's always a picture that goes with it, and I've seen a bunch of his buddies appear. Today, Sam's picture finally showed up, though I'm not sure it's the most flattering shot. You can see his latest look, blue jeans and t-shirts. That's all he wears these days. I got a pleasant letter from my doctor letting me know that I most likely have Gilbert's syndrome and not the other horrifying blood disorders that I looked up on Web MD when he flagged some weird test results. Apparently, Gilbert's syndrome (pronounced like you're in Paris) requires no treatment and does no harm. I hope it can still get me out of gym class. It was a long and full day. I'm pretty worn out, having spent hours at the park getting Emma to the point where she can ride by herself for brief moments. In the afternoon, the kids staged their epic shootout. At one point, we had ten kids ranging from 6 to 17 carrying all manner of Nerf weaponry. Emma came in first as exhaustion set in, cheerful but tired. Dave and Josh stopped by to chat, which was very nice. Josh is getting all settled at my mom's house, despite the fact that his room isn't quite finished and may not be for awhile. It'll be nice having him so close again, as I fondly remember the days when he'd stop by after walking home from Roosevelt. I made noodles for the kids, two different types as their tastes are different. Emma put away a tremendous amount of yaki soba, her new favorite meal. Sam was more subdued with his, begging for some of the root beer left over from the party. After Emma got to bed, Sam and I watched a little Chuck, and now it's time for me to turn in myself. I was so proud of Emma today. We started this morning with bike riding, went back home to pack a picnic lunch, headed back to the park for lunch and more riding. After several hours of practice, she got to the point where she could ride without me touching her for five or ten seconds. It was pretty cool. It's Sunday morning and we've all had breakfast. I made myself a mocha because, well, I can. Sam's playing computer games and Emma's giving advice. In awhile, our day of plans will begin. Friday afternoon Sam went to Zach's house to play, while I took Emma down to the park to practice bike riding. Jamie got pizza and joined us for our traditional pizza and Mythbusters. We're having some issues where Jamie feels like the kids are always with me, so we're trying harder to coordinate kid play times. There was also a little miscommunication in the evening where I wanted to take Sam to an astronomy event after sunset and Jamie wanted to go out. Still, it was a little spur of the moment and Emma took longer to get to sleep than expected. Saturday morning I took Emma for a play date with her friend Stella. I really like her parents too, and might invite them over for dinner sometime. The dad is a kindred spirit, into gaming and works as a web developer. While Emma was away, Sam and I worked on his web site, doing some programming for his site's games. When the play date was over, I took the kids down to campus to see the Superhero art exhibit at the U of O Art Museum. Sam was more interested than Emma, though she liked some of the crafts in the kid area. Wandering around campus always brings back a sense of nostalgia from when Jamie would bring the kids to me when I worked at the hospital there. 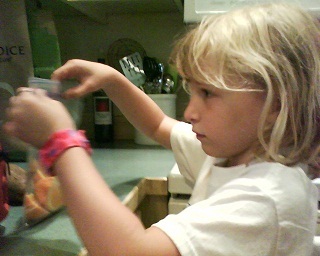 In the afternoon we got ready for my Buffy party, with Jamie helping the kids make cookies. The party itself went relatively well, though I wasn't sure what to do with the vast quantities of food and wine everyone brought. Jamie went over to M's house to provide moral support for remodel projects. I cleaned up, got the kids in bed, and Sam and I watched an episode of Chuck before retiring for good. Emma woke up crying when I went upstairs, and I ended up falling asleep while trying to get her back to sleep. We told the kids that Jamie and I were having problems at breakfast, giving them reassurances that they'd be okay. It was very high-level, and they didn't really seem to understand the implications yet. I'm sure that once we start talking about living arrangements and such, the reality will sink in. As for today, I'll do a library trip with Emma, take the kids to the park for more bike riding. Sam still wants a shootout with the neighbor kids. Jamie's taking C to the park in early afternoon and hopes to invite the kids along. We may end up having dinner with everyone tonight. We'll see how it goes. Sam and I worked on his website today. If you go to samatopia.com, you'll see a new banner and on the Play page, he's uploaded Stick Man Adventures. The latter is all his, with just a bit of advice from me. 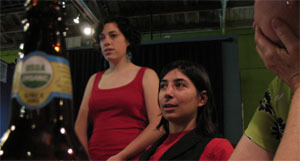 The banner was more collaborative, as Flash is a tricky language to program in. "I kinda told you what to do," he added just now. He's the vision guy and I'm the lowly programmer. 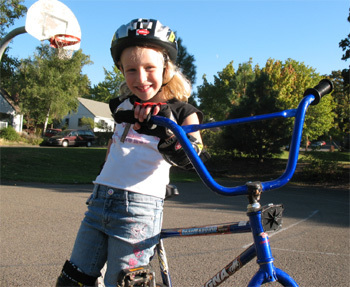 Emma and I went to the park after school, practicing bike riding. She did pretty good, not quite getting the hang of it, but by the end she had the steering and pedaling down pretty well. With a few more practice runs, I'm sure we can get the balance figured out. We took a break and ran into Yayoe and the rest of her band playing Ukuleles. They were practicing for a real gig, but for the time being it was Emma and I's personal musicians. Between hanging out with Adam and the kids (virtually speaking) and school, there's not lots of time left for the day to day household operations. Greg pulls through with laundry, we share cooking (although his last dinner was Ben and Jerry's), and he does almost all of the shopping. His current method of finding the right brand of a particular food item is buying them all. Yogurt was a greater challenge than the month devoted to milk, but we're doing our due diligence. I have friends remodeling their first houses themselves while getting advanced degrees... but isn't it enough to finally know what yogurt really makes you happy? Though parts of my world may be crumbling, there's always Mocha Friday. I've yet to hop in the shower and gather that delicious elixir, so I'm eager with anticipation. I was somewhat down after yesterday's counseling session, but I'm feeling somewhat better. Though it's clear that Jamie and I's marriage is over, I'm hoping we can work through a transition to get us to a better future. It would be great if we could keep everything civil and shield the kids from some of our contentious issues. For now, I'm trying to be patient and live with this somewhat uncomfortable situation until we figure this out. In terms of the weekend, I hope to take the kids to the U of O Art Museum tomorrow, as it's both free and showing off a superhero art exhibit. In the afternoon is a Buffy party I've thrown together with assorted work friends. Sunday I have a shootout planned between the neighbors and our kids at high noon. Somewhere in there, my dad has offered to help fly kites. All-in-all, it promises to be a fun-filled weekend. 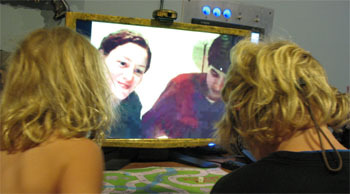 Sadie, Greg, the kids, and I all had a wonderful time playing charades over Skype. Emma in particular loved acting out her chosen movies and books. Jamie and I came back from our first counseling session and I'm feeling a little sad and nostalgic. We've both come to the conclusion that our marriage is over. It's still been less than a month for me, so it all seems like a huge whirlwind with barely time to adjust. I remember planning our future together, blissfully happy and feeling like such a lucky man to have so wonderful a family. Now I'm ordering books on divorce that our counselor recommended. Jamie and I are having tension over the kids and possible future living arrangements. For now, I feel like I'm still stuck in a limbo of sorts. It's uncomfortable, but I realize that none of this will be resolved quickly. There are bright spots here and there. Jamie's job prospects look reasonably good and she's getting organized to rejoin the workforce. Don't tell Emma, but she's getting an award at school tomorrow. I've assembled a veritable army of friends out of coworkers, old friends, gym buddies, and the occasional passer-by. With every ending, there is a new beginning. Though Jamie and I have serious issues to work through, I hope we can be cordial about it. I want the kids to know that we both love them and they'll be okay in the future. Sam's school is really embracing the web and e-mail this year. I've gotten several e-mails from Emma's teacher and daily updates from Mr. Wines, who is Sam's math teacher. We've had forest forest fires the last few days, the air outside filled with smoke. This morning my car was sprinkled with ash and a blood red sun rose in the sky. I suppose if I was superstitious, I'd see them as omens and portents for our counseling session tomorrow morning. I'm hoping that tomorrow marks the start of a transition out of our current situation. Things have been really hard for the kids lately. I got an apologetic call from Sam's PE teacher, saying that he'd been acting up in class, which she added never normally happens. Emma's been having a lot of fears of school and everything else. She had a nightmare a couple nights ago, of creatures attacking her and Jamie and I getting divorced. I really want to get to the point where Jamie feels comfortable talking to the kids. I keep telling them that we love them, it's not their fault, and they will be taken care of. I'd like to do more. In some ways, life continues as normal. Sam started fencing yesterday, which he said was fun. Emma and I drew, performed science experiments, and played with her stuffed puppy last night. She only woke up once, early in the morning. I lay next to her for a long while, rehearsing what I was going to say in the counseling session and hoping I can keep my family as safe and happy as I can manage. Emma and I do mad science in the kitchen. Emma has gone to war, specifically against the wart on her big toe. We picked up some Compound W and she's been cheerfully putting it on twice a day. She does say that it tickles a little, but it's a big improvement over the freeze stuff. Jamie's back from Edgefield. She was here a little early and surprised me by being at Sharon's house when I arrived to get the kids. It was somewhat awkward, but I got the kids home. Emma's playing next to me with the neighbor kids and Sam's working outside in exchange for cash. Since he discovered Nerf guns, he's all about money. Sunday was strange, but I made it through. The kids and I did some shopping, and I got Sam a new pair of boots that he seems to like. I did a bit myself, and the kids were generally enthusiastic about my choices. In the afternoon we wandered over to Todd and Victoria's house. The kids had a great time running around with the neighbor boys, each coming up with some Nerf gun or another. Now Sam's lamenting how short it is and asking to get another set up for next weekend. I'm still breathing, which helps. The outpouring of support from all corners has been phenomenal. It's been great just hanging out with the kids and doing fun things. Trying hard to be upbeat. I wish I were wiser. I really think carefully about my sort of matriarch position and can't figure out how my grandma Sadie Jones was always so smart. Is there a Wise Old Person book I just haven't read yet? Today was Jamie's 40th birthday, as well as Talk Like a Pirate Day. At the moment, the kids are in bed, Jamie's off with friends, and things seem very still. Last night was a little rough, as Emma was feeling pretty sick. I spent most of the night next to her, as she was sporting a fever and fairly miserable. Fortunately the Motrin has kept her cheerful today and I think she's on the mend. Unfortunately Sam seems to have it now. Somehow I've missed it so far, but it's probably just a matter of time. This morning Jamie made breakfast and went to get her hair done. Emma and I started the sourdough bread while Sam played on the computer. I took the kids to Toys-R-Us so the kids could buy Nerf guns, and then over to Home Depot to pick up some supplies. Next we dropped Sam off at Zach's house and returned home to work on Jamie's birthday cake. 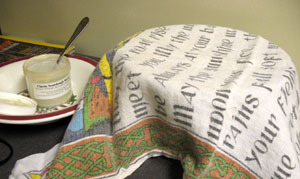 The sourdough bread turned out quite well, and that ended up being our lunch. I zipped off to pick up Sam and then we had a short birthday celebration for Jamie. Around three, Jamie went to her main birthday party at Pat and Carlanne's. 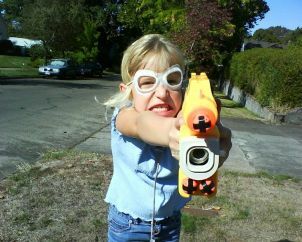 I took the kids across the street for the first of the epic Nerf shootouts. I traded Todd and Victoria cake and bread in exchange for some split pea soup. Eventually the kids wandered home for some quiet time. I took the opportunity to replace the electrical outlet in the shed with a black one, and put the nice brass plate over it. 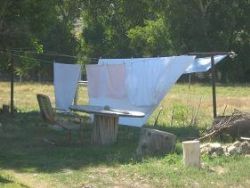 I also took out the tattered tarp that covered the sand box and put in a new one. I managed a bit of weeding and ripping out the fig tree before Emma wanted to play with me. The kids were both seeming under the weather, so I decided to skip the Talk Like a Pirate Day party. Instead we had a quiet dinner, played Sorry!, took baths, and got kids to bed. Sam really wanted to watch Chuck with me, so we had a brief viewing before I sent him to bed too. Tomorrow Jamie's off to Edgefield for her post-birthday trip. I'm mostly hanging out with kids, and perhaps having dinner with the neighbors while our respective children shoot it out. Emma and I made sourdough bread for Talk Like a Pirate Day. Sadie sent it along in her care package, singing its praises. Right now they're on the cooling racks and I'm eager to see how they turned out. My kids would love any addition to their Nerf arsenal. Still - don't worry about it if shipping costs much. We're going to stock up tomorrow in time for the Sunday shootout. Adam: I have several boxes of various Nerf guns that I was giving away. Some need ammo but all are in operational order. Can I box them up and ship to you? My kids have outgrown them and my grandkids are toddlers...I hate to have them sitting. How about Legos? Knex??? It's yet another sweet Mocha Friday. I'm using the cup Jenny got me, with a shrunk down version of Sadie's Mocha Friday poster put inside. It works beautifully and is quite stylish. It's hard to tell, but I might have actually had a little extra beverage put in by the barrista compared to the normal cups. Last night was a bit of a whirlwind. As soon as I got home, Sam was complaining about homework. I rushed him out to the shed (or the "Chamber of Learning" as I called it). Soon enough he was trudging through his spelling homework, even though he got 100% on the pretest and doesn't actually have to take the spelling test today. I tried to give him a little hope by saying that he's a candidate for the TAG program and might get to do some more interesting things. 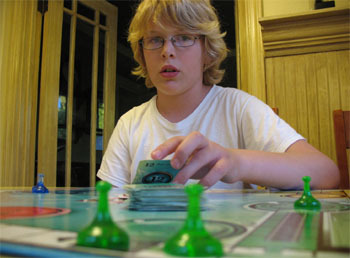 After that, I gathered up the kids and headed down to the basement for our weekly gaming session with Sadie and Greg. Jamie went off to visit with Victoria, so we had the house to ourselves. The game of the night was Elephunt Hunt, which Greg taught us as we went along. The first game was a little touch-and-go, as Emma had a sore throat and I had to take her away to finish her homework. The second game was just Greg and Sam, which Sam won handily. We were later talking about Greg and I said that I liked him. "Greg's awesome," was Sam's feelings on the matter. I gave Emma some Motrin for her sore throat, and after an hour she perked right up. After bath, she went around selling things around the house, to Sam and I's great amusement. This morning she was still feeling under the weather, though, so she's staying home from school. Depending on the babysitting situation, I may go home to watch her while Jamie works. I'm trying hard to spend time with the kids this weekend, with relatively minimal running around and doing things with other people. That's not to say the weekend isn't filling up. Saturday I'm taking the kids to Toys-R-Us to stock up on Nerf weaponry while Jamie gets her hair done. Then we're baking a cake and sourdough bread for Jamie's very small birthday party. In the evening I hope to take the kids to a Talk Like a Pirate Day shindig. Sunday morning we have D&D in the shed (Sam's been begging me to continue the campaign). Emma has requested that we teach her to ride a bike. In the afternoon we have a tentative movie run. In the evening, I'm hoping to use the recently purchased Nerf arsenal to engage in a shootout with the neighbor boys across the street. Should be fun. Emma decided to "sell" assorted items in our house through a series of clever videos. Remember, it's fun to wipe. Yesterday I got a big box in the mail from Seraph! It had lots of goodies from England, from a modern wall clock to a sweet jam pot. 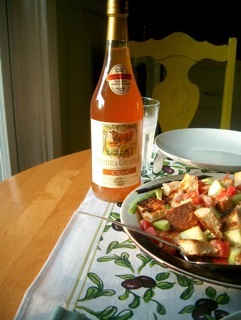 We enjoyed one of the linen tea towels from Herrod's and Somerset cider for dinner this evening, a perfect meal of grilled corn and a cucumber, tomato, and bread salad, all from the farmer's market this afternoon. Greg and I are preparing to play Elefant Hunt with Adam, Sam, and Emma over Skype for Thursday game night. The board game is from a gaming magazine from 1984 called Dragon 88. It's totally awesome. I had lunch with Jamie yesterday, both of us courteous and a bit tentative. She sounds willing to see a counselor with Adam, and I didn't press her on about them seeing individual counselors. Everyone brings his or her own history into a marriage; sometimes it's a helpful foundation for marriage but sometimes personal history undermines one's best efforts to have a healthy adult relationship. Today was the League of Women Voters luncheon I've been sweating over this summer; it went fine. Emma and I had an evening to ourselves, as Jamie went to the gym and took Sam to go swimming with Chase while she worked out with M.
Emma declared that she wanted to have Chinese food. I was originally skeptical, but she suggested a compromise where we could walk there. That sealed the deal and I asked if I could invite someone along. She thought it a fine idea, so I called my mom up for an impromptu dinner outing. The walk over the hill was lovely and cool. Emma chattered away about everything and it was fun to see the neighborhood. The house at the top of the hill has started their annual graveyard for Halloween. The last of the roses were still in bloom along the hidden path we take to get down to Three Forks Wok & Grill. Food was good and Emma impressed my mom with her chopstick skills. We got home and she had a bowl of ice cream while I cut out the game pieces that Sadie sent. Then it was off to bath and bed, reading storybooks and looking through a book of Fairy Art that I found at the library. Occasionally my work gets a little bit of local press. The Register Guard reported on an application I wrote that shows what the current wait time is for the ED. Theoretically if someone had to decide which hospital to go to in an emergency, they could check my little web application. I got Jamie a Zune to make her gym workouts better, and loaded up a bunch of pictures on it. After looking at old pictures of himself, it turns out that Sam decided he looked extra cool with long hair. 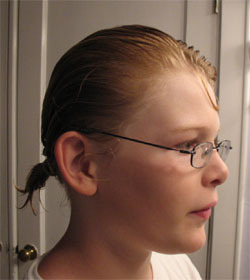 The only logical conclusion was to grow it out, so I managed to force it into a pony-tail. I've been really proud of Sam lately. Though life at home has been stressful, his spirits have remained relatively high. We've been talking about him taking on more responsibilities and gaining new freedoms. School has been going really well, and he's doing homework and taking tests like a pro. He also keeps expressing annoyance with glasses, so I want to get him into contacts when we next see the optometrist. reputation. The kids kept busy, but you can tell that Emma is anxious and Sam is subdued. For the first time, I feel really discouraged. To answer Sadie, I did a quick listen to both of her CD mixes. I cried on the way to work while listening to Sadie's. While driving home, I listened to Greg's and perked right up. "Fett's Vette" in particular really hit the spot. Jamie and I were scheduled to have our first counseling session today. It went about as bad as humanly possible. Our counselor never showed, so Jamie and I went for a walk. Jamie emphasized once again that she doesn't want to be married and started talking about separation. That gets right to my deepest fears about having my kids taken away from me, so I ended up crying a lot. I'll see if I can find a new counselor tomorrow. I can't believe it's only been three weeks and my entire life has changed. Greg would like to know which mix CD you prefer. 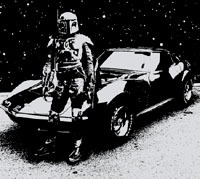 It seems that he believes that "Fett's Vette" was more appropriate than "the Weight." I guess mine was heavy on The Weepies and Josh Ritter and a little lighter on the Weird Al. School is now at a steady, terrifying clip, and being a TA makes my week much more challenging. Students feel like I have something to teach them, and I am concerned that if I do not teach them the way they want to be taught, they will not learn the concepts. As though I have anything to do with their learning! My song and dance, all the reading, and many, many pictorial aids seem not to work. They get confused. They get scared. They talk about Kanye West. I have to figure out what the problem is, because everyone who has taken the class in the past let me know that it was crap. I don't think its the material, or the professor, so... it must be me. Or whomever was me before this semester. I'm going to dig down into the next reading, a classic ethnography called "Aint' No Makin' It", and drag them down with me. Sadie sent along a care package, filled with wonderful trinkets and talismans: an old skeleton key, a small compass, and an iron nail. I read the book If You're Afraid of the Dark, Remember the Night Rainbow to Emma last night. While she did homework, I started cutting out the game pieces to the board game she sent. This morning I began getting the sourdough starter ready. Finally, there are two CDs that I'm bringing in the car today. Jamie and I have our first counseling session together today. I do hope that Jamie isn't entirely decided about our future together. It's been hard finding time to talk with her, so I'm hopeful I can get a better sense of what's going on. And like Sadie's book says, if there is no happy ending, make one out of cookie dough. Another weekend comes to a close. This morning Jamie made Challa french toast and then headed off to the gym. I played with the kids for awhile in the basement and then headed to the library to stock up on new books. We handed over Sam to Menina for a play date with Sophia. Emma ended up with a play date with Stella, her parents dropping her off while running errands. It was the strangest thing, having Sam gone, Jamie gone, and Emma occupied. The two girls played so well together that I could do endless chores and periodically check on their well-being. I managed to clean up the scrap drywall, clean out the garage, do the laundry, and clean my bathroom. It was pretty incredible. Jamie returned and picked up Sam to go the movies with friends. Sam returned later, a little disappointed in the movie. Jamie went off again for drinks and dinner. The kids and I went to my mom's for Bob's birthday. They loved the food, as did I. The sangria and homemade beer were tasty too, though I only had it in small amounts. We got home, and joined the neighbor boys for a short Nerf shootout. The kids got things ready for school, had baths, and went right to bed. Tomorrow we return to work and school, back to the new routine. I think the shed is finally getting to the point where I'm going to call it done. 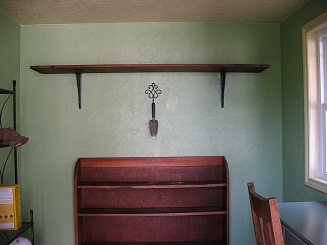 Over the last couple days I added my mom's hooks she got me for Christmas, put up shelves using shelf holders from Rejuvenation, nailed baseboard in the loft, and screwed an existing shelf into the wall. I also added a touch of Victoriana, changing out the typical light switches with old-fashioned push-buttons. It's strange working on the shed when I'm not sure what's going on with my marriage and the future of the house. It could be that we sell it, in which case this is all for the buyer to appreciate. I'd love to stay in the house, but it's hard to say how financial things will fall out. Or maybe it's a small measure of hope, that there is a future where our family stays together and is happy. I take solace in creating beautiful spaces, places of calm serenity. Last night was our traditional pizza and Mythbusters night. I stuffed myself with pizza and enjoyed the assorted fire and hypnotism myths. This morning Jamie made crepes as Sam ended up not wanting to make breakfast at the last minute. She's feeling a little under the weather, but still felt up to going to Portland to see the Escher exhibit with a friend. The kids and I met up with Jason and Riley in this big wetland in west Eugene where they were having Family Exploration Day. They handed out nets for catching bugs, binoculars, and a backpack full of assorted books and goodies. 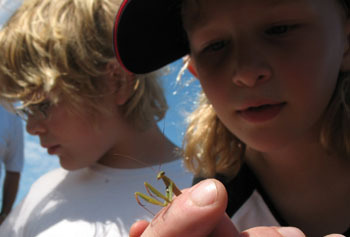 Jason had great luck finding things, catching several dragon flies, a frog, and a preying mantis. Even though Emma didn't want to go, she had a great time once she got there and it took some effort to get her home. I'm taking a short breather before we collect John and head to Splash for the afternoon. There's a new movie called "9" that's opening this weekend. It has a post-apocalyptic stitchpunk vibe, with interesting visuals to match. I've heard mixed reviews, but I also hear it looks stunning. In any case, I signed up for a contest to win a 9 gift package from the SciencePunk blog. It turns out, I won and the mysterious package should arrive next week. I had to call up Sam and tell him the good news. Emma gave me a panda for luck a couple weeks ago and I told Sam that maybe it was starting to work. He agreed and went to tell Emma after hanging up. 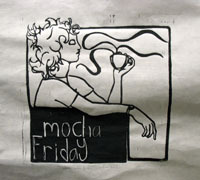 It's another Mocha Friday, though I've yet to leave home and pick up that delicious beverage. The kids started school this week. Sam seems to have picked up right where he left off, nonchalantly talking about math tests and spelling homework. For Emma it's been a bit harder. Last night after school she seemed very tired, and it took all my effort to get her to finish her homework. She explained how she hated school, and when I started to list all the different aspects of going to school, she told me it was all of them. Hopefully it will get better with time. We managed to sneak in a little gaming night with Sadie and Greg via Skype. 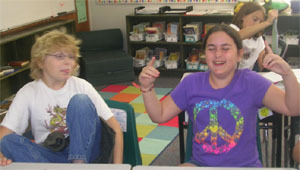 Emma was pretty exhausted, but she acted out some of the phrases I was trying to get them to guess. Sam got in on the action and was able to guess a few they threw our way. Still, it was necessarily short as Emma had to get to bed quickly. 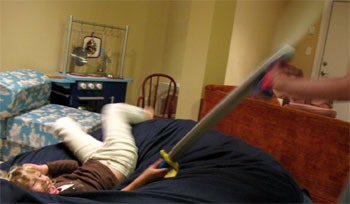 The kids have also loved the foam swords my mom got them. For the last couple nights we've had epic fights in the basement. Unfortunately Emma found out the hard way that we may need to move our old t.v. cabinet. She's very brave, but bonked heads still hurt. As for me, I continue to try and reinvent my life. My goal continues to be to take care of myself and the kids. Surrounding myself with people helps immensely, and I'm trying to set up activities for the weekend as much as possible. Saturday we have an expedition to some wetlands and Splash in the afternoon. Sunday is more tentative, but I'm seeing if I can set up a play date and perhaps take Emma to the movies in the afternoon. When it comes to Jamie and I, I don't know what's going to happen. I go from bleak despair to glimmers of hope and back again. I love her, and hope we can work this out. After a comedy of errors, I finally have a joint counseling session scheduled for next week. Perhaps that will help. Sadie, either go in town more or get him The Globe once in awhile. I am reading Crunch, by Jared Bernstein, as Gregory reads aloud the Grafton News to no one in particular. "Oh, wow, someone else donated their hair... this must be a regular feature! Hmm, the candlepin bowling league's record again... the VFW is having a flag burning ceremony... I wonder if they yell obscenities at the police, too?" Maybe we'll go into the big city tonight for dinner. Adam and Jamie continue to be uppermost in my thoughts. Whether you believe in good thoughts, prayer, or "holding in the light", as Meggie, my Quaker sister does, please keep them with you. They have fifteen years and two beautiful children together. I remember thinking when Lohring and I divorced after nearly 25 years of marriage that it was like having all the flesh taken off my body and having my bones scraped, and I know it wasn't a lot of fun for him, either. was complaining about all the work sheets her teacher assigned (they start school in mid-August) and she told me to warn Emma not to get too excited about homework, because by third grade it was no kick. Somehow Isa is reading Romeo and Juliet. She seemed put out that they had to buy The Complete Works rather than just Romeo and Juliet. Chaucer in Middle English next? Things are back to normal. New roof completes the color scheme. Jim promises new floor upstairs this winter.@!!!!! I drove Emma to school today, which was a big treat for me. I think it was the first time she'd ever ridden in my car, as I was testing out the new car seat she'd be taking to school when she carpools with Sophia's family. Along the way she asked that a skateboard be added to her birthday list. I can tell already her teen years will be exciting. She just called me a few minutes ago, asking when I'd be coming home. Now she's excited to do her homework with me, which was one of the things I told her I liked about her going to school. It's funny how these small traditions bring me great joy. I walked Emma around at the ice cream social tonight. She had a pretty good time, finding her best friend Stella in the crowd. Best of all, their family isn't moving away like they'd planned. She also found Isabella and the three of them ran around like wild monkeys for awhile. Once we got home, Emma and I packed our lunches together. Her first lunch was an orange, a juice box, and crackers and cheese. I ended up with lots of fruit, yogurt, and a sandwich. I'm taking Emma to school tomorrow, which I'm very excited about. Her teacher is Ms. Stewart, the same as Sam had so long ago. I'm back at work, having got an unheard of ten hours of sleep last night. I put Emma to sleep and conked out in her bed. After crawling back into mine, I slept pretty solidly until six when Emma showed up and I had to go to work. "See you at the ice cream social!" she told me, referring to tonight's pre-school gathering. Sunday the kids and I played at home until after noon, with Emma taking a small break to help me make home-made hamburger buns. We then headed off to my sister's for a short visit. Emma was nervous about their puppy and I carried her a lot. Sam had a great time hanging out with the older boys and wished he could stay longer. When we got home, I started getting ready for dinner with the neighbors, shucking corn and that sort of thing. The kids played amazingly well together, occasionally bringing me in to play the part of a troll or dragon. 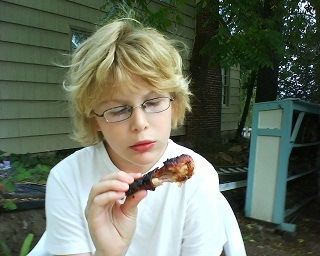 Around dinner, Todd showed up with his grill and our assorted children began to play. Dinner was very tasty, and everyone returned home satisfied. The kids were soaked, having brought out the water guns, but happy as we tucked them to bed. We're back in town. Jamie was gone when we arrived, so we went to the Eugene Celebration and had a good time. The kids were starving, so we found noodles and hot dogs. We later ran into Zach and his family, so the boys played together while Emma and I did virtually every free craft thing in the kid zone. "What about my snow cone?" asked Emma just now. Yes, they both got snow cones as a celebration treat. All the way back, Emma dripped snow cone juice on my head as I carried her on my shoulders. We'd walked there, so when we returned, everyone was tired. Jamie was driving away when we walked up the hill, but she came back and briefly said hello before going out to dinner with someone. I whipped up a quickie dinner, and now we're making obstacle courses in the basement. I'm slowly figuring out my new cell phone, entering the modern era. The number is 541-912-7415, in case you want to update your address book. It's a "pay as you go" phone, so I get charged for using it. Still, don't let that stop you from calling if you need to get ahold of me and can't find me at home or work. We had such a full day. Jim and Judy left early to go to the Beaver game. Emma was up before 7 am, and Sam was up soon afterwards. I had Sam make his own breakfast, and he did a pretty good job. "I made a bagel with eggs and cream cheese," he commented over my shoulder just now. After hanging out for awhile, we headed through the heavy rain to OMSI. It was great getting there so early, as it was so empty. We then proceeded to spend six hours there, having all sorts of adventures. Almost at the beginning, Sam managed to rip the tip of his sandal off while riding up the escalator. Emma was initially afraid of the CSI exhibit, then loved it so much she made us go back two more times. Emma was also fond of the animals, including a giant centipede. Sam's favorite thing was the "shock box", which didn't have much of a wait to use. Basically one person holds on to two copper tubes and waits for someone to turn a crank. It then shocks the first person, causing their muscles to fling backwards to great amusement. Sam talked me into try it and I wacked him in the face. We had a break for lunch, but otherwise it was non-stop science. When three o'clock rolled around, I finally pulled the kids out. Emma was a little sad, as she could have stayed even longer. On the way back, I stopped by a nearby stored called Rejuvenation, which had all sorts of wonderful antiques and reproductions. Though I could have easily spent thousands, I settled for a handful of trinkets ("and do-dads!" says Sam). There's something hopeful about making one's home a better place. Now we're back at Jim and Judy's, waiting for them to return with pizza. Yesterday we did Thai food, so the Friday tradition of pizza and Mythbusters was shifted to today. We got back from OMSI a little while ago. While we were there, we went up the escalator and it ripped off the tip of his sandal. Initially I was a little annoyed, thinking he was playing around. Soon it dawned on me that he hadn't done anything wrong and he nearly lost the tip of his toe. We made it to Portland, safe and sound. Traffic was horrible, and we ended up getting into town around 5:30. Jim and Judy took us out to dinner at a nearby Thai place. The kids really ate a ton, loving the pot stickers and Phad Thai. We'd hoped to go to the school playground to work it off, but everything was closed due to construction. I set up my new cell phone and it generally seems to work. I've finally joined modern life. I'll have to run upstairs in a minute to get Emma to bed. Staying busy, as always. We've had a really busy week down here! I can't even remember what we did on Monday! On Tuesday Robbie and I helped out in Isa's class. It was really a great experience for both of us, and it's helped us a lot to keep Isa pepped up about school. We're going to try and help out once a week until our own work schedules pick up later in the fall. On Wednesday, Robbie and I did a bizillion little errands in Taos. We also closed our BofA bank accounts after 14 years with them. We are now set up with a much smaller local bank. Yesterday morning I went into work to help set up the new ticket printer. This, of course, did not go smoothly. I'm also working on a "user friendly" manual for the new POS system that I've been helping with this summer. In the afternoon we all went to a friends house and made apricot jam (I now have a dozen jars on my counter), and picked a box of tomatos from her garden. The woman, Pam, and her husband are very active in the Penasco community, and Robbie and I might help get an activity/social center set up for teens at the community center. Today, Robbie took Isa to school, then headed up to the Taos library to work on homework and his on-line courses. I'm taking advantage of catching up on a weeks worth of internet work, and laundry. Somewhere in here I also have some fresh plumbs and apples to turn into a tart, and some bread to bake. It's another Mocha Friday. Soon I'll be heading off to pick up that delicious drink, hoping its mystical healing powers will cure all my ills. Last night I took the kids to Mystic Pizza to listen to Anna play. While we didn't actually get to hear her (Emma got too tired), we did have a pretty good time eating pizza, playing chess, and chatting with Anna and her family. I don't think the kids actually go downtown much, so Sam in particular thought it was pretty cool. As a measure of my mental health, I was actually hungry for a change. There's something about beer and pizza that deeply satisfies. I'm off to Portland as soon as I come home from work. I think I've lined up a Eugene Celebration visit with Jenny and dad for Sunday. I've asked the neighbors if we can do a Labor Day BBQ. Since we have no grill, I'm hoping they accept. Dave, Kirsten, and Josh came over last night for dinner. Jamie made a fine lasagna. Dave and I managed to move the huge monstrosity of our old entertainment center down into the basement. I'm not quite sure what we'll do with it there at the moment. Jamie's thought is that it would eventually become a kid entertainment center. Once we moved it, it triggered an immediate need to rearrange the living room, which is halfway towards some new state of perfection. Just to put my plans out there for the next few days, I'm planning on taking the kids to Cosmic Pizza around 7 pm tonight. Hopefully we can catch a little of Anna's music before everyone gets too tired. Friday after work I'm taking the kids to Portland to visit Jamie's parents and OMSI. Sunday I'm heading back and going to the Eugene Celebration. Monday is a little more fuzzy, but I'm thinking of taking the kids to Splash and trying to get a BBQ together with the neighbors. If anyone wants to go to the Eugene Celebration with the kids and I, give me a holler. that my heart hurts to think of all this. fights) so they had to resign themselves to the wrapping paper rolls (the wrapping paper was 50 cents a roll at Hirons, and in the toss-out closet. A bargain at twice the price. Makes a darn good sword, too.) Both kids seemed in good spirits; Emma has seemed aware, at least subconsciously, of Adam's and Jamie's problems, and has been uncharactistically subdued. just slipped away, way too quickly. And how couldn't you have fun with Jordan. We picked him up last Friday afternoon and headed off to see "Shorts"
undoubtedly one of the dumbest kid movies in a generation. But you just can't beat Jordan as a movie companion. He pronounced it the "best movie ever." Bob asked about Godzilla movies, and Jordan, after reflection, modified his review to the "second best movie ever." Adam and I have been Skyping quite a lot lately. A few nights ago, I got to read Emma my favorite book, "The Pigeon Finds a Hot Dog." Last night, Adam, Sam, Emma, and I played an awesome game of Apples to Apples before bath and bed. It seems that my east coast schedule and the schedule of pacific time elementary school kids are perfectly aligned. It's a nice infusion of kid and brother love, and I like to think that Sam and Emma like to exchange weird faces with me over three thousand miles. Maybe we can get matching sets of Cosmic Encounter and start playing weekly- the ultimate nerd good time. If anyone wants a "Team Adam" t-shirt, I'm taking orders. I took the kids over to my mom's house last night for a BBQ. Sam found a foam sword and I was handed rolls of wrapping paper. When my Christmas present arrives with torn and dirtied paper, I'll accept it with a smile. By now, just about everyone is aware of what's going on between Jamie and I. Even the kids know that something's up, as Jamie's gone most evenings and my mom let slip to Sam that we weren't getting along. I want to talk to Sam soon in more detail, though I put him off last night so I could talk to Jamie first. This is all new to me. I had a sense that things weren't right about a week ago, ended up confronting Jamie, and she let me know she wasn't very attracted to me and wasn't sure she wanted to stay married. She asked for time and space, which I've been trying to give to her. She's out most evenings while I watch the kids. If I had to give an extremely simplified version of what happened, my feeling is that we're both overachievers and focused far too hard on being great parents. I stopped being the fun, hang-out-and-do-things Adam that Jamie married. Jamie turned into a stay-at-home mom and every time I came home, wanted to get out of the house. The end result is that we weren't doing much as a couple and Jamie started to feel not very close to me. I think there were also a lot of transitions happening. The kids are going to school full time soon, the first for Emma. No longer are there little kids in the house. Jamie's turning forty in a couple weeks. My sense is that all those things are bubbling up at once. When I look back, I remember Jamie leaving hints here and there about wanting to spend more time together. I shifted some things around, but clearly not enough. One of my big frustrations is that it seems like it's too late now and she's not really interested in spending time together. If only I'd known months ago, I'd be happy to reevaluate everything. It's been a hard week since then, with lots of tears, lack of sleep, and not really eating much. Feeling horrible comes with the territory, and it's usually just best to let it run its course. I've been feeling better lately, though I fully expect to slip back into sadness now and again. That's in the past, though, and I'm focusing on next steps. I've been pulling together Team Adam, talking with friends and family all around. Odds are, if you're reading this and are in the area, I'm going to invite you to do something soon. Being around people helps immensely. I'm also dusting off the Take Charge Adam. For far too long, I've deferred to Jamie about social events and managing the kids. It feels good to plan things with friends and make decisions. Confidence is my new watchword, even if sometimes I have to fake it a little. I'm seeing a counselor today, which I'm pretty excited about. Slowly getting there, wherever that may be.